I have a 1992 Chevrolet S-10 pickup truck with a 4.3L V6 that will crank up but idles really low. When putting in gear the truck almost cuts off, however if you turn the air condition or heater on the truck will die right down and cut off. I have replaced the idle air control valve, the EGR valve, the map sensor, and the tps. What am I missing? Please help! This is a 4.3L with a TBI - a very easy to work system without a scanner- the BASICS will apply and can be easily checked. Charging system - battery good alt putting out? have you checked for codes- OBDI system is limited BUT a start. The CEL - does it come on at every start @2 seconds then go out? It turns over and starts right up. I haven't check for codes as I don't have the necessary tools to do so. As for the CEL, I have no idea what that is, I'm a rookie at working on automobiles! This truck was giving to me by my father-in-law. It has 238,000 miles on it. It ran good when I got it from him, however, trying to do good by the truck that was giving to me I put Sea Foam cleaner in the gas tank, thinking I was doing a good thing but ever since I used the Sea Foam it has not ran right. It immediately began idling lower. Could that be the problem? Have you burned through that tank of fuel yet? Yes sir, many times over, I have even tried other injector cleaners, fuel additives, etc. but nothing has worked so far. I did find a broken gasket under the injectors where it attaches to the throttle body. You can get what is called flash codes from this year of vehicle. Jumper the terminals that are shown in the diagram below. You'll find this connector under the left (driver's) side of the dash. You count the flashes for example a code 24 would be 2 flash and pause and then 4 flashes. Each code will repeat itself 3 times. Once you find the connector install the jumper wire (Steel paper clip works fine), then turn the ignition to the run position with out starting the truck. The check engine light should begin flashing codes. I'm getting two different set of blinks the first one is dot-dot,dot; the second is dot ,dot-dot,dot or if you will, blink-blink,blink; the second is blink,blink-blink,blink. I don't know what they mean but that is what it is doing! If you read it correctly that would be a code 34 MAP voltage low. With the engine running make sure the MAP sensor has vacuum being supplied; that the line is not cracked and leaking vacuum. If that is OK; disconnect the MAP wiring harness and jumper terminals B &C (I think the light gray wire and the gray wire); the connector should be marked ABC. Start the engine and do what you have to to keep it running. Shut it off after a few minutes and recheck codes. If you have a code 33 now; that will tell us that the ECM (computer) and wiring is OK for that circuit; replace the sensor. Sorry for the size of the images any smaller for the component locator and I couldn't read it. Thanks I'll try it out and will get back to you as soon as I can. Also, how do I check to see if it is getting any vacuum? With the engine running pull the vac line off the sensor and put your finger over the end. You'll likely have to play with the throttle to keep the engine running. There should be enough vacuum to just hold the line to your finger. Which of the other test have you done????? When I took the hose off of the map sensor the truck idled up but when I put it back on the truck idled right back down to just about nothing. Code 34 is MAP voltage low. I was wondering when you were going to post code 12; because if you didn't; I'd know you were doing something wrong. You're going to have to start doing some meter testing. Or throw in the towel and take the truck in. I'll be off line likely until tomorrow. Gather all your thoughts, organize them and then post a detailed list of things you've tested along with the results. Remember I'm not there to see what you've just finished doing. You have to tell me/us. 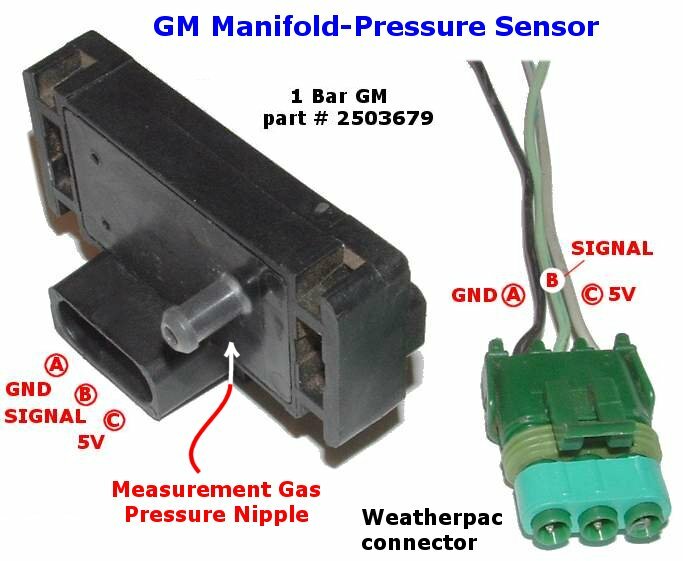 the 2 codes TPS ad MAP both low voltage... using the great picture of the map sensor to guide you see if you have 5v at the sensor, same for the TPS... Next check the ground portion of the sensors, like I said an easy system to work and being so common lots of tips developed over the years. Both sensors are registering 6V. How do I check the ground?